One of the aspects of living in Spain that always surprises me is just how up to date Spain is in terms of technology. For example, banking in Spain is way more advanced than in Canada – with just a few clicks I can send money to any other person in the EU using their IBAN number. Credit cards can easily be added to Apple or Android pay (unlike in North America where some banks are still holding out, trying to release their own competing services), and payments can even be split up over multiple months (not that this is a good thing, but it’s neat that they at least have the option). Another area which is great to see some movement is in cryptography. Spain allows you to obtain a digital certificate which essentially can be used to verify your identity, cryptographically, when using websites online. I hardly know anyone who has done this, probably because it’s a bit complex, but it has a ton of advantages – for example, once you have a digital certificate you can skip going in person to many government offices for simple items, like getting another copy of your empadronamiento. I’ve even been told that once I obtain my digital certificate I can even renew my non-lucrative visa by submitting, and cryptographically signing (which proves my identify), all my documents. Visit the website, and start the process for a personal certificate (for a legal person, not a business or representative). You’ll need to enter your name and enter your NIE number. Start the process now. Once done, you’ll receive an email with a 9 digit confirmation number. Next you have to visit a social security office in person with your residency card, passport, and confirmation information from the previous step. Once they verify you are who you say you are, they’ll activate your certificate, which you can later install on your computer. This step essentially links your physical identification to your digital one. After you can download your certificate and install it on your computer, allowing websites to verify your identify. I’ll update this post as I complete the process, but so far I have completed the first step. 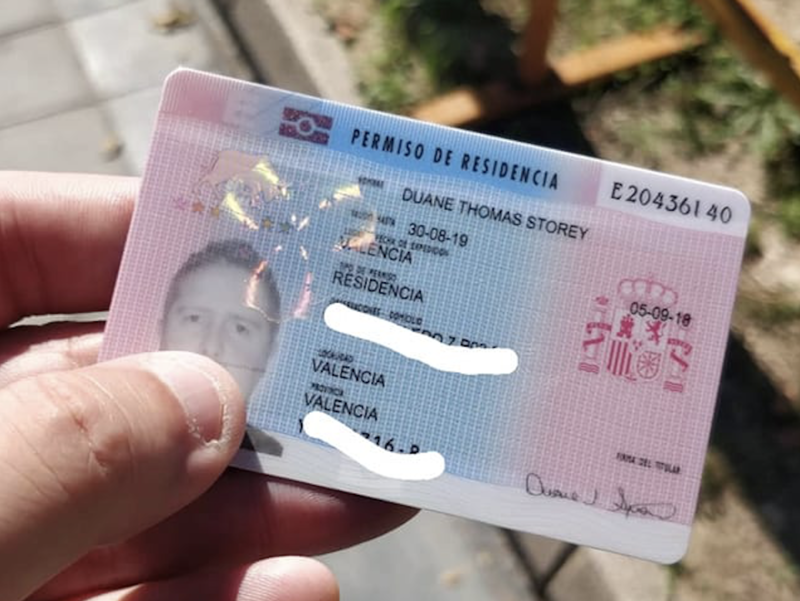 Once I get back to Valencia next week, I’ll visit a social security office with my identificaiton and update the information here. If this works the way I think it will, then I should hopefully be able to whiz through my non-lucrative visa renewal process in June by submitting everything myself. Approximately two weeks ago I hit my six month milestone here in Spain, and as such, thought it would be a really great time to update everyone on my Spanish adventure. 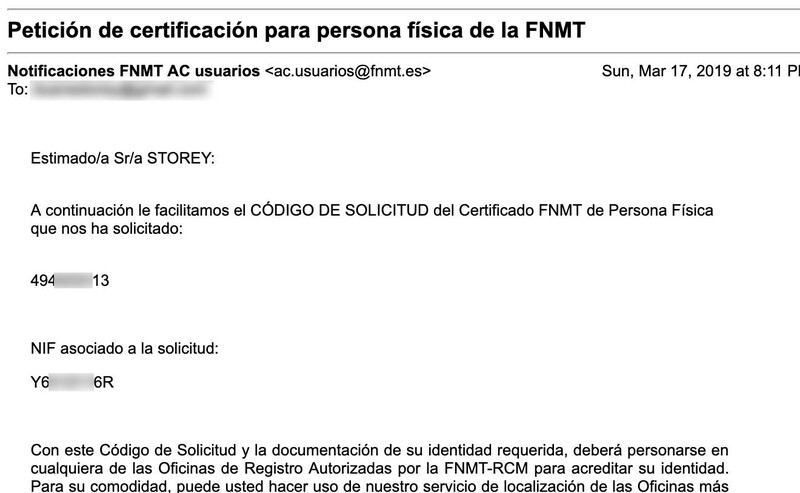 In case you missed it, last year I applied for (and was granted) residency to live in Spain for a year. My original plan was to travel around Spain and potentially visit various different parts of the country over the course of my stay here. Unfortunately as soon as I arrived I quickly realized that one of the requirements of my residency required me to actual obtain a rental contract for at least three months. Unfortunately that basically meant my travel plans went out the window since I would need to rent an apartment somewhere. 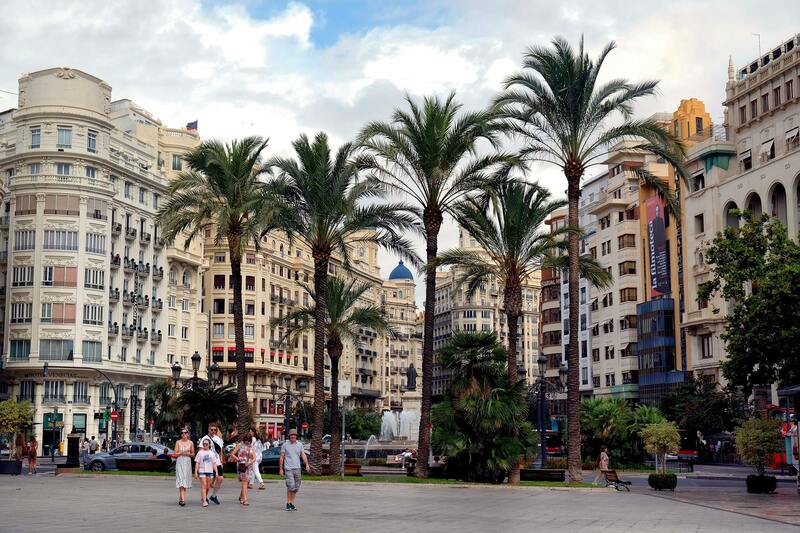 The city I eventually decided to stay in is the beautiful Mediterranean city of Valencia. I’m really happy with that decision for the following reasons. First, I really like being near the ocean. In terms of large Spanish cities, that limits you to Barcelona, Valencia, and Malaga mostly, as most of the other large cities are inland. While I don’t live right next to the ocean, it’s just a short metro ride or a bike ride away, which is great. Second, in terms of Spanish culture, Valencia has a nice balance between local culture (such as the annual Fallas festival), and a fairly vibrant ex-pat community. Many locals that I talked to last year encouraged me not to choose Barcelona, mostly because it’s become overrun with tourists and is starting to lack in Spanish culture. Madrid and Seville were both on my list as well, but since they aren’t close to the water and have rather unique climates (Madrid gets quite cold in the winter, while Seville, known locally as ‘the frying pan of Spain’, can reach 50C in the summer). And lastly, Valencia is really very affordable compared to many other larger Spanish cities. While rent isn’t as cheap as it used to be, in general the low cost of both food and alcohol more than make up for it. For example, a typical glass of wine at a local restaurant runs about 2€ ($3 CAD) normally, with tapas usually costing from between 5€-8€ each. In the supermarket you can buy a whole chicken for 4€, and a bottle of wine for 2-3€. Taken together, a normal meetup with friends in the evening, complete with lots of food and wine usually runs less than 20€, which would be about $30 CAD back home. Meeting people can be difficult in any new environment, and I encountered a bit of that myself in Valencia. Spanish people tend to have tight social circles, with most adults essentially hanging out with people they grew up with. So as a foreigner it can be pretty difficult to get invited into one of those circles, even more so if people think you will just be leaving again soon. So I certainly haven’t met as many actual Spanish people as I had hoped. 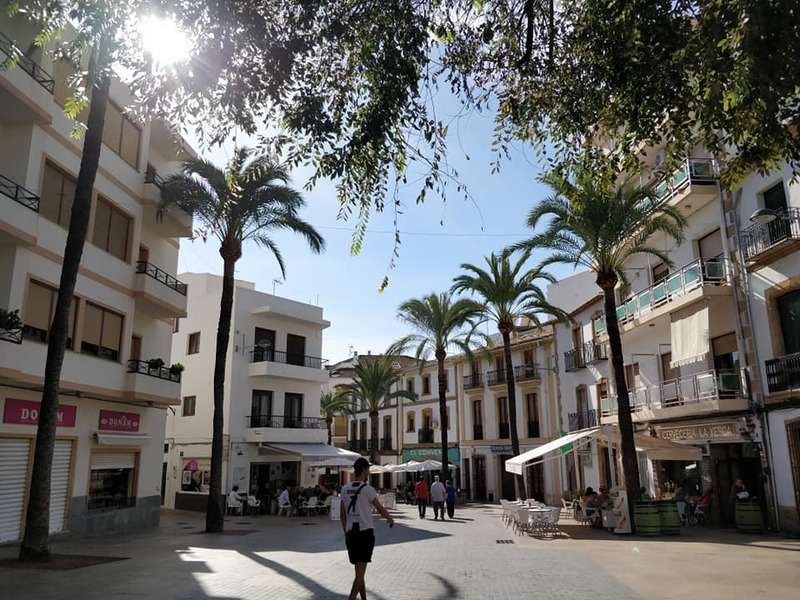 But Valencia does have a very active ex-pat and remote worker community, and I’ve met and become friends with various members of the Valencia Coffee and Co-working Group. That group meets weekly for co-working and evening drinks, and it’s been great hanging out with most of them and getting to know some of their reasons for moving to Spain as well. When I first arrived in Valencia, I took an intensive Spanish class to augment what I already knew. That was actually really quite useful, but unfortunately I found it really difficult to work while going to school as it was just *too* intense – four hours of class per day plus homework in the evenings. I found myself pretty exhausted each night. Since most of my friends here are expats as well, I haven’t had too many opportunities to practice Spanish on a daily basis (other than ordering food and what-not, but that’s pretty routine). That said my comprehension has definitely gone up, and I can certainly communicate much better than when I arrived. But I do need to focus on it a bit more deliberately going forward if I really want to improve. I live 10 minutes from the main train station in Valencia, which means it’s quite easy to go on a weekend trip whenever I want. 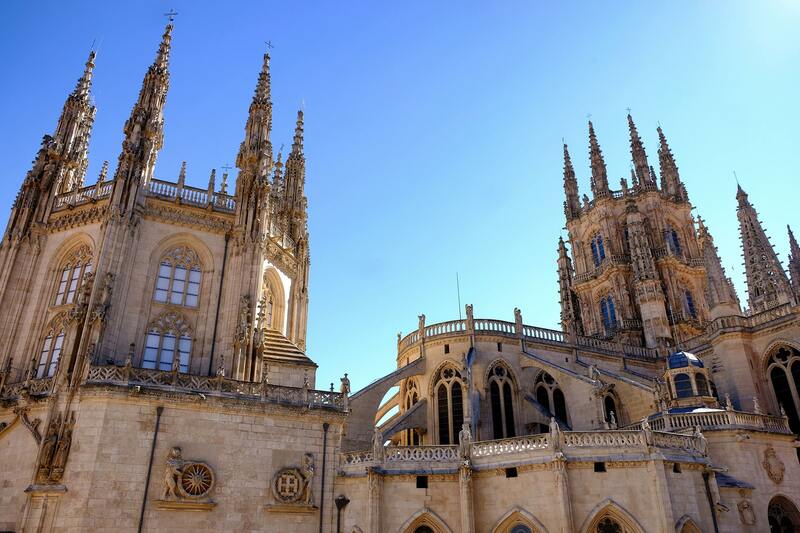 I went to Burgos one weekend to meet some friends walking the Camino de Santiago, and that took me about 10 hours by train. But getting to Barcelona is only about 3 hours by train, Madrid is only 2 hours (via high speed train), and Seville about 5 hours I believe. 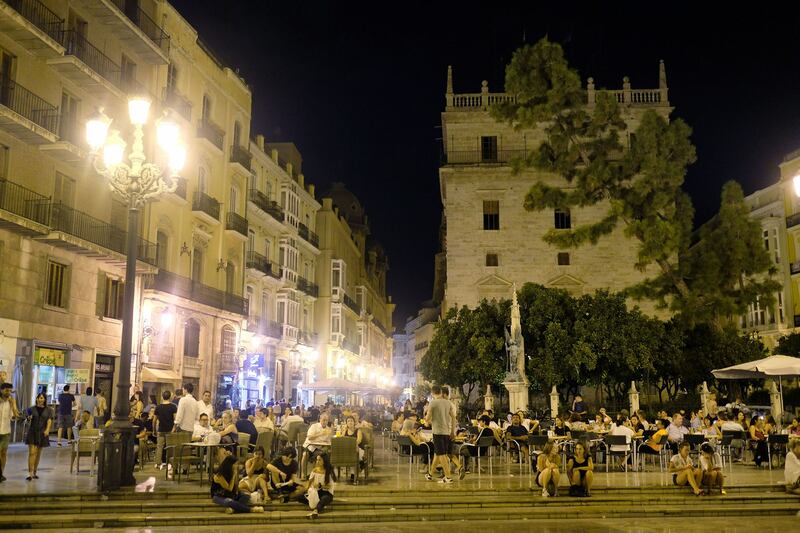 So while Madrid is probably the best spot to explore Spain from, Valencia is quite well connected as well. I’m hoping when I renew my residency next year that I’ll be able to explore around Spain a bit more. One of the aspects that eventually made me choose Spain as the country I wanted to try living in was the work/life balance. Someone from North America would probably look at someone in Spain or Portugal, seemingly always out enjoying themselves, as lazy. But the truth is the Spanish people I know are all hard workers. What is different though is that they look at work as a way to enable them to do the things they want, and not as a way to accumulate a lot of expensive items like most people in North America do. So this translates more into a work-to-live philosophy as opposed to the live-to-work one you see in many other countries. Dinner in Spain doesn’t really start until 9pm or so, which often means if you are going out that you are going to be out until midnight or later. But once you get used to it, it’s actually really quite nice. The idea of eating dinner at 6pm now seems a bit strange to me, and I really enjoy the late evening dinners (which are often much smaller than we would eat back in North America – tapas and beers amongst friends, for example). 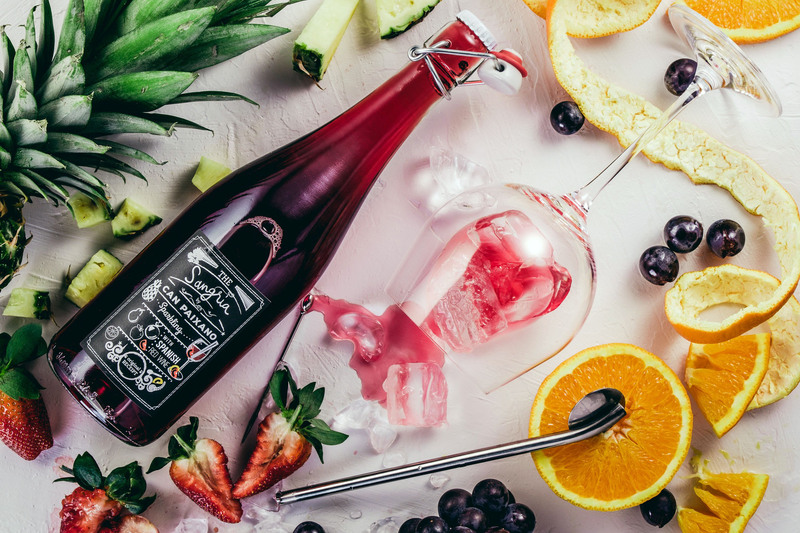 Customer service isn’t that great in Spain – if you order a drink, it’s more likely they will forget it here, or if you are ready to order, sometimes it’s hard to convince someone to take your order. But you get used to it after a while, and just adapt – for example, if you nobody is taking your order, you simply kill more time talking to your friends without getting too worked up for it. They have an expression here in Spain, “no pasa nada”, which basically means “don’t worry about it”. So whenever I hit something like that in Spain, I just smile and reminded myself “no pasa nada”. In just a few weeks I’m heading back to Canada for my first visit since I arrived in Spain, which I’m looking forward to. Until then, I’m down in Javea near the ocean, which is one of my favourite spots near Valencia. I’m currently in Jávea, Spain, which is actually where I was in May of 2018 when I first came up with the idea of moving to Spain. Jávea is a cute idillic location right on the Mediterranean with a population of around 27,000 people. The closest train station to Jávea is actually in a little town about 15 minutes away called Denia. That means Jávea is a bit isolated, which in many ways is a positive since it’s still a bit of a secret. Denia is actually one of the locations you can catch a ferry to Ibiza, so there are many great things to do in this region. One of the aspects I like about Jávea is the combination of the old, represented by the old city, and the new, which is represented by the port area near the water. 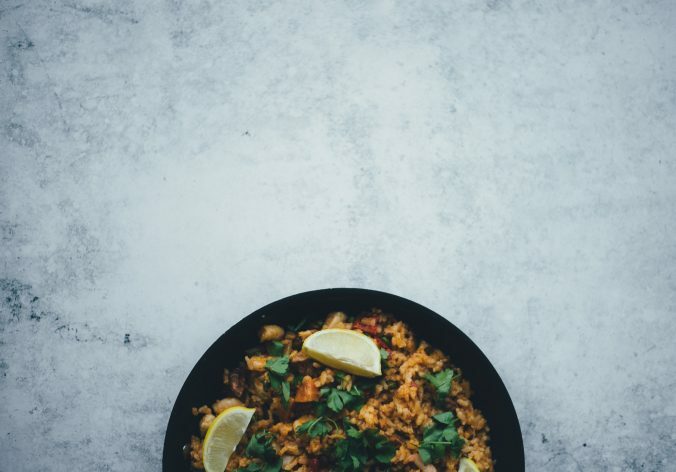 Depending on your mood you can go grab some tapas in the old part of the city, or head on down to the port for some paella near the beach. Further on down the beach is the Arenal beach area, host to more restaurants and a few clubs if that’s your thing. Jávea is quite touristy in the summer, mostly from Brits visiting the area. But in the shoulder seasons there is a nice mix of foreigners and locals in the area. I’ve been toying with the idea of buying some real estate in the area, as the prices for older townhouses is quite reasonable still. I’ve always wanted a ‘fixer-upper’ type of project, so it would be fun to renovate an historic townhouse and then rent it out in the summer months (which are typically too warm for me as a fragile Canadian!). There is plenty to do in the area, especially if you like hiking and exploring – Montgo is a popular hike in the area, and the mountain itself is usually visible on the horizon from Jávea. Without a doubt, Jávea is a gem in the area. So if you find yourself in the area, make sure you stop and check it out. If you do visit and are looking for an interesting co-working or co-living experience, make sure to check out Sun and Co, which is where I’ve mostly stayed during my visits to Jávea. After managing to complete your appointment to get your TIE residency card, the next step is to simply wait the 30 days until you are allowed to pick it up. I actually was going to be busy that day, so I went down around day 28 to the police station. I was originally told to just show up, without an appointment, so that’s what I did. When I arrived there were several large line-ups, one on each side. I was told picking up your TIE card is really quick, so I assumed neither one was for me. But once I showed the attendee my piece of paper and told them I was here to pick up my TIE card, then directed me to wait in the line on the left. The line moved rather slowly, so I was probably outside for 40 minutes or so. When I finally made it inside, they directed me to a series of four chairs which acted as a mini queue for the lady giving out the TIE cards. Dealing with each person took 2-3 minutes, so I just waited my turn. When it came time, I walked up, handed the lady my paper and passport, and then waited. She reached over to her table and grabbed a stack of about 100 cards from a table with about 30 stacks – quite a lot of cards! She quickly thumbed through them until she found mine, then set it in front of her. I was expecting her to hand it to me, so I was wondering what was coming next. She then asked me to take my fingerprints again – I’m not sure if this is because my last fingerprints didn’t come out properly, or perhaps they need to verify it was actually me. Regardless I quickly did my left and right index fingers, and that was it. She handed me my card and told me to have a great day, which would be easy since I was now done all the hard parts about moving to Spain for a year! If you’ve made it this far as well, then congratulations – you are now a Spanish resident! If you’ve found this page, chances are you’re a Canadian, looking out the window at the snow or the endless months of winter dreariness. I know, because that’s exactly what I was doing approximately a year ago when I came up with the idea of moving to Spain from Canada. And here I am now, a year later, living in the beautiful coastal city of Valencia and eating paella with new my Spanish friends. You can read about some of my reasons for moving to Spain here. So what does it take to move to Spain? Well, since Canada isn’t a part of the European Union, it’s a bit tricky. Normally Canadians are only allowed to visit Spain (technically the Schengen Zone) for three months in every six month period. 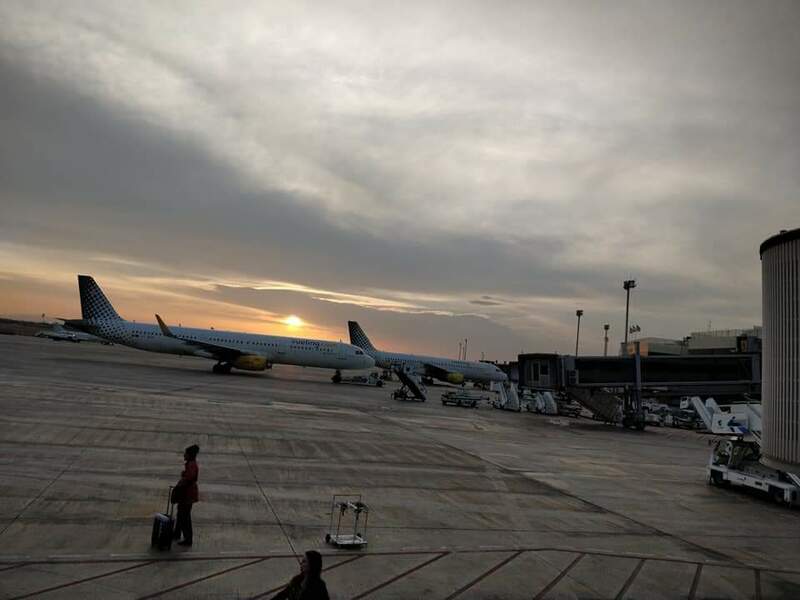 While some people thinks this resets the moment you leave, in actuality it’s a rolling six month window – if you’ve been in Spain for three months in the previously six months, then you aren’t allowed to stay longer. That’s a bit of a pain if you want to stay longer than three months. But if you’re here, chances are you are looking for something more permanent. So I’ll give you a few of the options. The first way to get into Spain is to have a job offer, at which point the company can sponsor a work permit for you and you can get in that way. The problem with that is most Spanish companies have to first prove that there isn’t a local who can do the job they want you for. Unless you have a unique skillset or are in demand, it might be difficult for the company to do that. The second way is to become a student and obtain a student visa. The only problem with that is you have to go to school as a full time student. So if you want to spend most of your time in school, then that’s certainly an option. But for people who want to spend their time bouncing around Spain, or staying longer once school is over, that may or may not work for you. Another way a person can enter into Spain is to register as a self-employed worker, or autonomo. I don’t have any experience with that personally, but you can read about how to become an autonomo on the Toronto consulate’s website. The one downside is that you immediately have to start paying into the Spanish social security system, and the taxes for an autonomo I believe are on the order of €264 per month. So if you aren’t sure you’ll have any income for a while once you become an autonomo, you should save up as you’re going to have to pay that fee each month. The way I entered into Spain is via something called a ‘Non-Lucrative Visa’. The non-lucrative visa is a special type of visa for Spain that means a person can live here, but they cannot work. The latter part is a bit of a grey area in that it’s debatable whether or not a person can work remotely (for a company outside of Spain), but I do know some people who did get the visa while working remotely and declaring that with the Spanish consulate. You can read the entire requirements for the Spanish non-lucrative visa here, but in short, you need to be in good health, to not have a criminal record, and to also provide proof that you can live for a year without working in Spain. While some people have successfully approved by showing income made by working for remote companies, I have heard about more people who have been rejected for that. So it’s best to be able to provide proof that you can live on your savings alone, which as of 2018 is €2151.36 per month for all 12 months (so a bank account with €25,816.32) in it. I applied through the Toronto consulate in Canada, and surprisingly, it went rather smoothly. But in general you have to apply for a Spanish visa in your country of residence (and not within Spain). 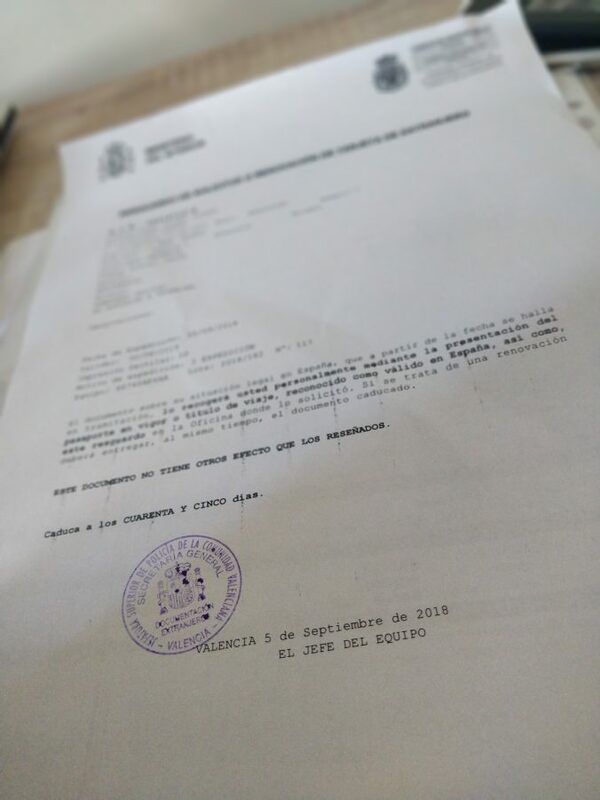 I started the process of obtaining documents for my non-lucrative visa in May of 2018, submitted the application at the start of July, and was in Spain at the end of August. So if you are motivated and fulfil the requirements of the non-lucrative visa, you can pull it off rather quickly. 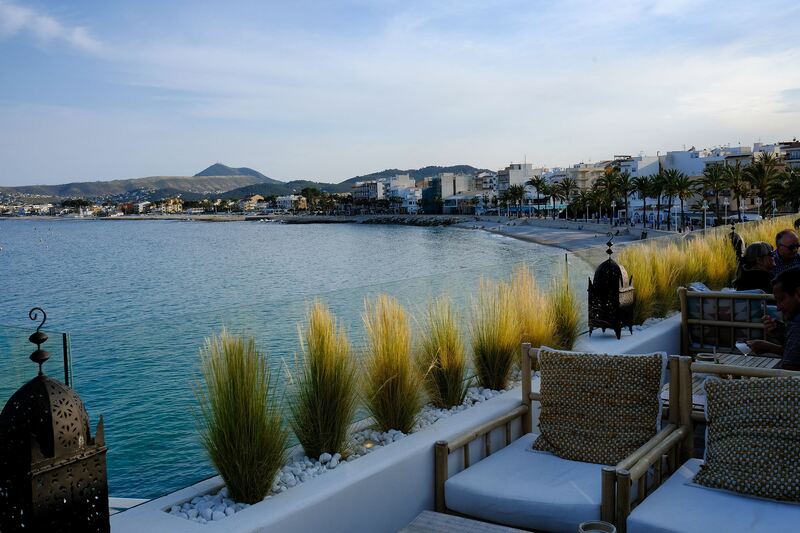 If you can imagine yourself living in nearly perfect weather year-round and spending your off-time sipping cervezas or vino tinto, then perhaps moving to Spain is a great option for you – it was for me. If you have managed to get yourself a non-lucrative visa (or other long-term visa), one of the first things you will likely notice is that the visa is only valid for approximately three months. When you applied, you did so with the belief that it would be valid for a year, so what’s with this three month nonsense? Don’t worry, that’s just part of the process. Upon arriving in Spain, you basically have a month to make an appointment to convert your temporary non-lucrative visa into a one-year residency. To do so, you need to register at the appropriate place, at which point they will receive a “tarjeta de extranjero”, or foreigner’s card (TIE for short). One colour photo on a white background, in European size. I brought a photo from Canada that I explicitly asked to be 40mmx30mm (the size of a European passport photo). I wasn’t sure that would work, but they accepted it just fine. A photocopy of your entry stamp into Spain. 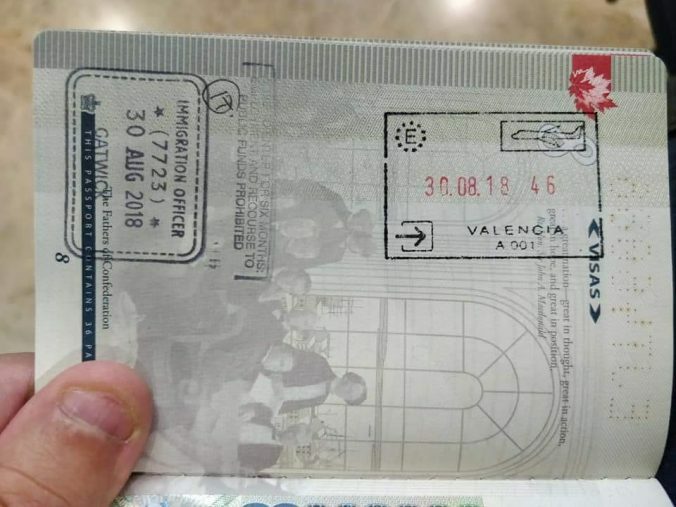 If you didn’t get an entry stamp (for example, if you entered in the UK), bring a photocopy of that along with whatever boarding passes or other proof you have for the date you entered Spain. Your empadronamiento certificate (your padrón) – this was the hardest item for me to get. Find out how to obtain your empadronamiento in Spain here. A filled out EX15 form, which is your application form. You can download EX15 here. A completed Model 790, Código 12, what you need to pay the associated fees. You can now fill this out online, which is best, since it will generate the barcode you need as part of the form. You can fill out the Model 790, Código 12 online. The option I selected was “TIE que documenta la primera concesión de la autorización de residencia temporal, de estancia o para trabajadores transfronterizos.”, which is for non-EU nationals applying for their first residency. It then auto-populates the fee to be paid at the bottom, which was just shy of 16 euros. Proof that the fees were paid from a bank. Once you have the Model 790 printed out, you can go down to a bank machine and pay your fees right at the machine. I had help doing it, but I think the options the lady pressed were related to bill payments, and eventually she had to scan the barcode. Make sure you keep the receipt, since that is proof you paid. Usually this will be the office for foreigners in whatever city you are in, but it’s quite possible it could be a police station in a smaller area. You should reserve your appointment online as soon as you have a rough idea of when you will be in town as often the appointments are a few weeks away. I booked mine from Canada the moment I received my visa back along with my NIE number (which is what you will need to reserve – not your passport number). I booked my appointment for the early evening, which turned out to be a good decision because it was pretty quiet inside when I arrived. Some people bring along someone who speaks fluent Spanish – I didn’t bother. I figured I needed the practice anyways, and maybe they would go easier on me if just did it myself and tried to smile and be friendly. After sitting for about two minutes, I was called up to the desk where a police officer sat. I told him, in Spanish, I was here to get my TIE card. He spread my documents out over the table, casually looked over them all, then started punching data into the computer. At one point he asked me to place my fingers into the finger print scanner and take a scan. Then he asked me to do it again, but this time roll them from side to side. Strangely though he only took scans of two of my fingers, one on each hand. Also I believe the only document he kept was the receipt for my payment and the application form. Everything else was returned to me. Afterwards he gave me an official, stamped document that indicated I was a resident – this document was only valid for 45 days. I was told I need come back in 30 days, at which point my official card would be ready.The meeting itself was actually really easy, so if you are stressing out about it, try not to worry. The best way to ensure the process goes smoothly is to arrive with all your documents in perfect order. I’ll pick up my card next week, so I’ll post a photo of that when I receive it. But in general this process went smoothly, so just make sure you are prepared when you arrive and you’ll do fine. The Empadronamiento, often called “el pardon”, is the process of registering yourself with the town hall in whatever city you decide to live in. This used to be a simple formality – basically you would go down, tell them the address you are living at, without proof, and they would register you. It seems now that the process is much more involved, possibly due to people taking advantage of it previously. So why would you want to get your padrón? Well, if you want to become a resident of Spain, or to receive your TIE card after arriving, you are going to need this document. Truthfully, this is the part of the process that caused me the most grief. I read beforehand that AirBNB rentals were not accepted for this process, so I decided to register at a school and take advantage of the included boarding. I quickly realized thought that it wasn’t going to work – if you don’t have a contract for an entire apartment (i.e. you are renting just a room), you need the person who owns the apartment (or someone who lives there and has also previously registered for their padrón) to vouch for you in person. I asked the school and they said they weren’t willing to do this for me. So much for that idea. I also learned during this process that the town hall’s typically want to see a three to six month rental contract to register you. Three months didn’t seem so restrictive for me, but six months staying in a city you aren’t entirely sure of seems quite onerous. I also heard rumours that seem people were asked to show a contract for a full year, which is even worse. So you should definitely plan to find a place to live for at least three months, and maybe just double check with your landlord that it would be possible to extend it to six months if you need (or ask them to put a clause in the contract that you can extend it another three months, even if you don’t plan to use it). I ended up renting a room in an apartment with a few other international expats, so I didn’t end up needing a lease. What I did need, and what I confirmed that my landlord would be able to give me beforehand, was to fill out authorization form giving me permission to register at his residence. He had to come down to the appointment with me, in person, will a filled out application form, and a signed photocopy of his passport information. They wanted to see this signature in person and verify his identify, so it’s best to make sure this person comes down with you. He was also asked to bring a bill in his name just to prove that he still has ties to the place (and isn’t just registered at the apartment because he forgot to unregister when he left). So my landlord brought a copy of his Vodafone internet bill in the apartment, which was enough for them. After that, they entered my information in the computer and printed out two certificates – one to be used for obtaining residency (which was needed for obtaining my TIE), and another one to use if I registered for public health (which I didn’t think I could do anyways, but I took it all the same). It wasn’t a very difficult process, but you really do need to have your documentation together for this. And often that means committing to staying somewhere for three to six months at a minimum. In case you’re debating trying to scam the system somehow (for example, making a fake contract), know this – they will sometimes send a police officer to your location after registering to make sure you are actually living there. So if you do try to fake it, not only will you likely get caught, but you could also get the person who actually lives at the location in trouble as well. I said that you couldn’t use an AirBNB for registering, but there actually is a way around it. Before booking, tell the person you are renting from that you need to get your padrón, and to get that you will need a rental contract. Sometimes the person who owns the flat will help you out and do up one that basically reflects the same terms as the AirBNB rental – if you both sign it, you can likely use that to register for your padrón, but you’ll definitely need something in Spanish that’s more official that an AirBNB receipt. Once you are on the padrón for a house or apartment, you essentially stay that way unless you unregister at a later date. 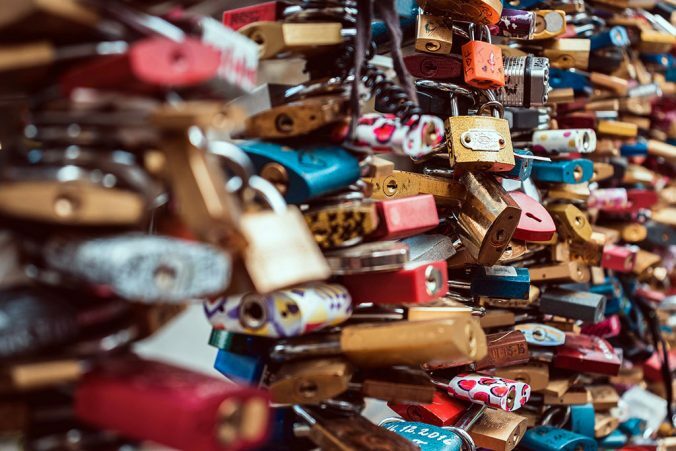 That’s why many landlords (especially AirBNB owners) don’t want anything to do with it – it’s a lot of work just to have someone registered at their place temporarily. And if you don’t unregister properly, it could cause them problems in the future. In addition, if you are renting from someone who isn’t declaring the income they receive, then without a doubt they won’t be helping you register at the location. I’ve heard a few stories of people actually managing to register at a temporary residence (AirBNB for example) without the owner’s permission. I doubt you could get away with this now, especially not in the larger cities. But once registered the landlord will eventually be notified (via mail) that someone has registered there, and if they didn’t give you permission, they will likely be pretty upset when they find out. I read a story from a Spanish landlord who said he was having trouble selling his place because someone registered at it, years before and without his permission, and now they won’t allow him to unregister that person without that person’s permission. So best to do this process properly. I was a bit surprised how difficult this process was, mainly because I included a letter in my non-lucrative visa application stating my desire to spend my 12 months travelling around Spain (and was ultimately approved) But the reality is that’s not really possible, or at least, not without renting a place for three months or longer at first. In retrospect, that’s not such a bad thing, as it’s good to spend some time in one place at the beginning and get settled, but I wasn’t expecting it when I submitted my application. But this process definitely caused me a bit of stress, primarily because I had pre-booked my appointment to receive my NIE card, and the date was fast approaching even though I hadn’t finalized a place to live, or my padrón. You’re going to need an appointment to get your padron, which you can obtain online at whichever town hall is closest to you. When I went to book mine, they didn’t have any appointments available for at least a month – since I needed to apply for my TIE card before then, that really didn’t work for me. So what I ended up doing was to go down to the town hall myself and then explain the situation. I brought the paperwork showing that my TIE appointment was the next day, after which they scheduled me for an ‘emergency’ appointment the next day, just prior to my TIE appointment. So I managed to get my padrón and my TIE all in the same day, which was great. Dealing with Spanish bureaucracy isn’t very much fun, but just focus hard and get through it. While everyone you deal with is typically nice, you quickly get the feeling that everyone is operating in their own little bubble chambers, and none of the different branches talk to each other (which is why you hear stories of people being bounced between two branches over and over because they keep getting told different stories). You’ll prevail, just like I did, so don’t worry. Welcome to Spain! You can read about my experience obtaining my TIE card in Spain here. 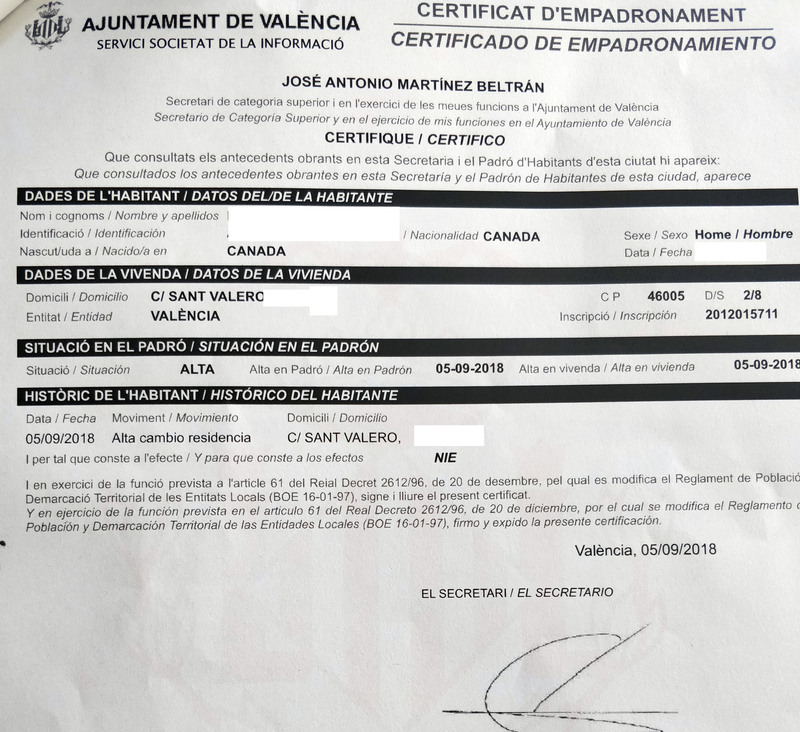 After I received my non-lucrative visa, I quickly finished closing up my life in Canada ( at least for a while ) and continued getting ready to head to Spain. I was debating a lot of different things at the time, one of which was whether or not I should bring an extra suitcase full of items I thought I might need in Spain, or to simply pack lighter and buy what I would need there. I chose to do the latter, mostly because I hate travelling with a lot of stuff. When the time finally came, I boarded an airplane at Vancouver international airport and set off to London, UK, as my entry point into Europe. One of the things I read was that it’s really important to have documentation on when you arrived in Spain for the first time. Often they will look for proof of arrival when you go to fill out all the paperwork you will have to do when you arrive in Spain. When I arrived in London, I approached the customs agent. She asked where I was going, and I said Spain. She then ask, “for how long?”. To which I replied “one year.” That got her to raise her eyebrow a bit, since I’m sure she’s well aware that Canadians can only spend three months at a time in the EU. I then explained that I had a long-term residency visa for Spain, which she quickly located inside my passport. One thing I didn’t know at the time is that there are four classes of EU visas, each with a letter: A, B, C, D. Type D is one that allows you to stay for a longer period of time, and I suspect she was looking for that on the Spanish visa. When she found it (I didn’t even know it was there), she made a few notes in her computer and then asked me just some genuine questions about why I was moving to Spain, and what the process was like. She then stamped my passport and told me to enjoy myself. 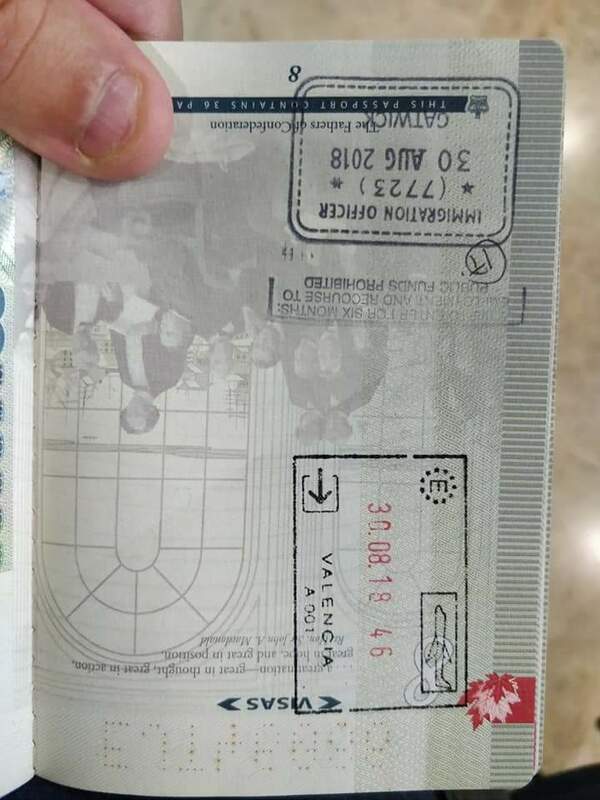 I was told when I would arrive in Spain (since it would be on a flight originating from the UK) that they wouldn’t stamp my passport there again. That would mean I would need to keep my boarding pass as proof of the actual date of entry into the country. So that was my original plan. But when I arrived in Valencia, Spain, a few hours later, there was a quick customs checkpoint. I was watching the agent there, and he wasn’t stamping any passports, so I suspect it was just a quick check to make sure everyone was legally allowed to be there. When I approached him though, I notice that he did have a stamp next to him, so I politely asked him if he would mind stamping my passport, which he happily did. So I ended up with an official EU entry stamp for Spain on the exact date my visa was valid on. I’ve heard of other people having to go to the police station to receive official paperwork indicating the exact day they arrived, but that seems a bit excessive to me. I would think it’s enough to simply do your best to get a stamp in your passport, or worse case, keep your boarding pass and any receipts in airports along the way that have the date on them. After 17 hours of travel, I was exhausted, but was thankful my arrival into Spain was pretty much non-eventful. The next step would involve obtaining my TIE card (which is what you need to make your residency semi-permanent), and my empadronamiento, which is the proof you need for certain government bodies to show you actually live in Spain. More on those later. 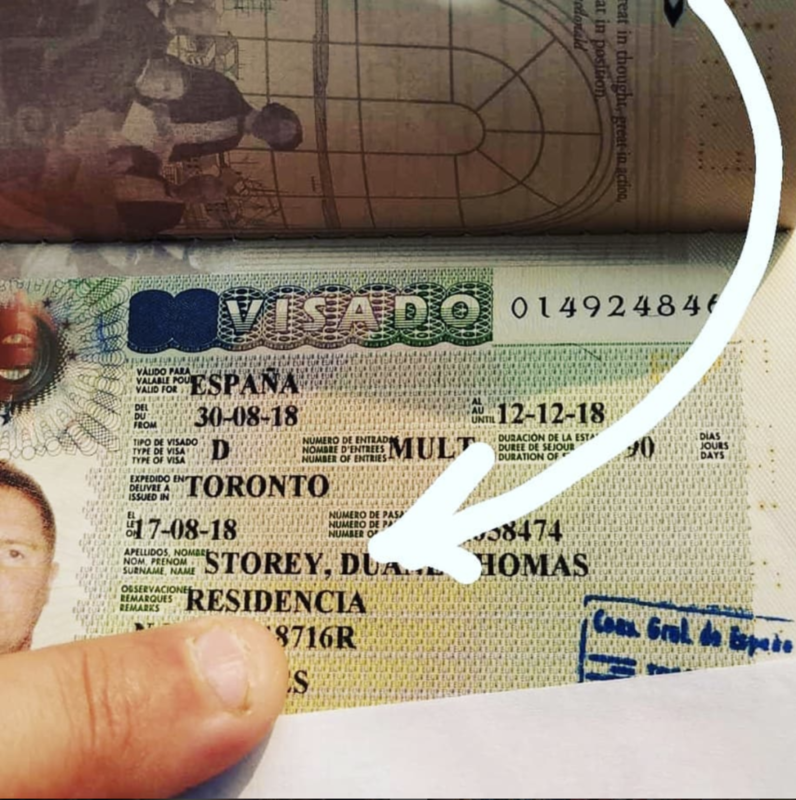 Yesterday I received my passport back from the Spanish consulate in Toronto – inside was my non-lucrative visa, which contains my NIE number that I’ll need in Spain. It’s possible to obtain a NIE without getting a visa (for example to buy a house), but they are issued automatically with your visa as well. I started assembling my documents In May, and mailed my application at the end of June. It took roughly six weeks for them to process the application, and approximately one more week to send them my passport and for them to mail it back. When I received the email saying my visa was approved and that they needed my passport, they also asked me to forward along my flight confirmation. I had a flight already in October, but decided to move it backwards and send the new flight information in. I’m glad I did since they used the date of my flight to set the start date of the visa. Had I not done that, my visa would have started in October, which meant I wouldn’t be able to fly to Spain early. So if you are doing this process, pay attention to when your flights are since your visa will likely be dated to that. In just one week, I’ll be heading to Valencia. It would be nice to say this process is over, but there are still things I need to do in Spain upon arriving, and not all of them are easy. As you can see from the photo, the visa is only valid for a few months. What is supposed to happen is that I have to make an appointment within one month and apply for the TIE (Spanish Foreigner Card) which is what will ultimately let me stay in Spain for a year or longer. One of the requirements for the TIE though is that you have a permanent place to stay – that doesn’t really work for me since I plan to bounce around for a few months at first. I’ve been told you have to show at least a six month rental contract, which I won’t have. So this is still a problem I’m working to solve. I do know a few people in Spain, so I may see if one of them would be willing to state I’m living (i.e. couchsurfing) at their house for a while, just so I can complete the registration at the town hall. Also, since I’m flying into London and will receive my entry stamp there, I’ve read I have to make sure I keep my boarding pass stubs for my flight to Spain to prove when I arrived there (since I won’t receive an entry stamp there). Without that they have no idea of when I actually showed up in Spain, and apparently that can cause a problem. But I’m definitely excited to have the non-lucrative process behind me – it ended up being fairly straightforward, and despite some complaints I read online about the Toronto consulate, my experience with them was really quite good . Just the other day I received notification from the Spanish consulate in Toronto that my visa had been approved. Since Toronto is three hours ahead, I received the notification while checking my email messages from my bed in the morning – what a great email to wake up to! In total, it took about 42 days from the time they received my application in Toronto until I received the approval notification. While I was purposefully trying not to bug the consulate with emails, I did send one at the two week mark just to make sure my application was around and they knew about it, and a final email politely requesting a status update at close to the six week mark. Since it was summer, I was trying to poke them from time to time just to hope my application stayed near the top of the vacation pile. But I was pleasantly surprised that it was approved in only six weeks as I figured it would take closer to twelve (like the website says). A few of the items I was potentially worried about in my application ended up not coming into play at all. For example, the Spanish health insurance I had purchased with Sanitas was primarily meant for entrepreneurs – even though I’m not working in Spain, it was accepted just fine. Also, none of my documentation was certified or translated into Spanish, which would have been a huge hassle to organize. I’m sure your mileage may vary depending on the consulate, but in general this process was fairly straightforward and my application was accepted without any issues at all. I mailed my passport to the consulate a few days ago, and it appears that it just arrived there this morning. As part of my original application I had to include a return express post envelope to mail my passport back to me. I scanned the tracking number into my phone prior to sending it off originally, which means as soon as the consulate mails my passport back to me, my phone should chirp and show me its en route. I had originally planned to fly to Spain at the start of October, but not that I have early approval, I’ve decided to head there at the end of August. As of yesterday, my house in Canada is officially rented for a year. I also sold my Mazda SUV a few weeks ago, which means I don’t really have any reason to come back, at least not for a year or longer. So in short, I’m ready to hop on a plan and start my new Spanish adventure!